René Cassin » “If we’re cut, we all bleed the same.” – the 80th anniversary of Cable Street. “If we’re cut, we all bleed the same.” – the 80th anniversary of Cable Street. René Cassin // News // Blogs // “If we’re cut, we all bleed the same.” – the 80th anniversary of Cable Street. “If we’re cut, we all bleed the same.” – James Masters writes about the 80th anniversary of Cable Street. For many the date of October 4 1936 is one that has slipped back into the annals of history. For others, it remains a day which will never be forgotten. 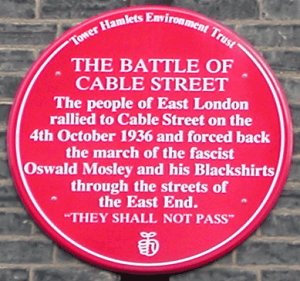 Now, 80 years on since the Battle of Cable Street, London is set to remember once again the day the Jews of the East End joined together with communists, trade unionists, Labour party members and Irish Catholic dockers to confront Sir Oswald Mosley’s British Union of Fascists and declare: ‘No Pasaran’. 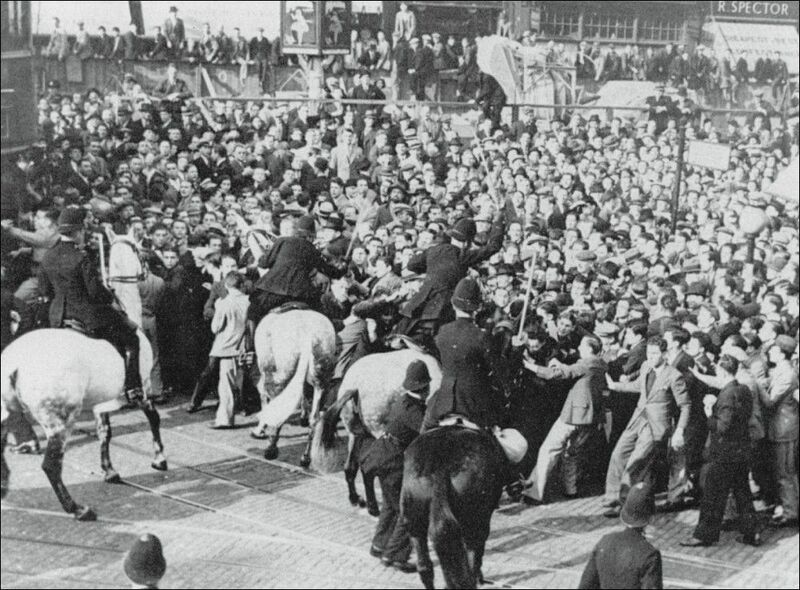 The slogan of the Spanish Civil War reverberated around the East End with over 200,000 protesters, or even 300,000 according to some reports, standing up against the fascism which was sweeping across Europe. By 1936 Hitler’s Nazis were already in power, while Spain’s civil war had split the country. In Britain, Mosley wanted to take advantage of the current fear, targeting the Jewish community by using them as a scapegoat for the ills of London’s working class. Mosley’s vision of causing havoc and engineering hate failed to come to fruition as his 7,000 Blackshirts, flanked by 10,000 police officers, were met with an unstoppable force of unity. Professor Bill Fishman, who died in 2014 aged 93, was 15 on the day of the march and was stood at Gardner’s Corner in Aldgate, the entrance to the East End. “There was masses of marching people. Young people, old people, all shouting ‘No Pasaran’ and ‘One two three four five – we want Mosley, dead or alive’,” he told the Guardian in an interview in 2006. “It was like a massive army gathering, coming from all the side streets. Mosley was supposed to arrive at lunchtime but the hours were passing and he hadn’t come. Between 3pm and 3.30 we could see a big army of Blackshirts marching towards the confluence of Commercial Road and Whitechapel Road. Stood between the Blackshirts and the anti-fascists were thousands of police attempting to keep the peace. 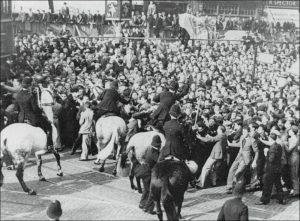 The protesters, well organized, had heard that Mosley wanted to take his men through Cable Street on their way into the East End. Despite the warnings of the Jewish Chronicle newspaper, which urged people to stay away on the day of the march, those in the predominately Jewish area of London refused to be cowed. The lessons of Cable Street remain to this day. On October 9 London Mayor Sadiq Khan will join with delegates from trade unions, Bangladeshi associations, anti-racism groups and Synagogues to mark the occasion. While most of those who were at Cable Street on that fateful day are moving towards the end of their lives, their wisdom remains for all to see. “I remember the day so vividly, I can see it clearly,” Willie Myers, who was just 14 at the time, told The Guardian. 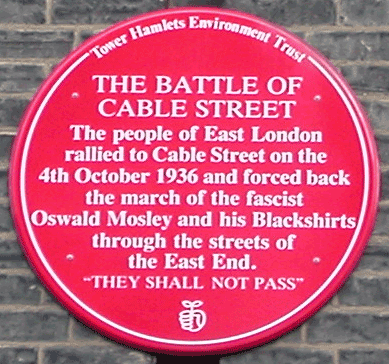 “After Cable Street, we carried on the fight against fascism and racism. Even today, if I had to do it all over again, I would. James Masters is a journalist, previous René Cassin Fellow and current activist. René Cassin is a UK based NGO, which engages the Jewish community on a range of human rights topics such as modern day slavery, discrimination and asylum.